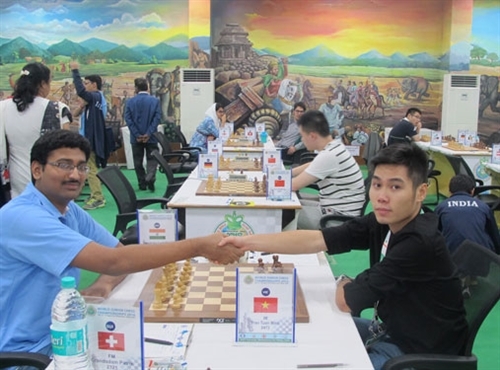 HÀ NỘI — Vietnamese chess player Trần Tuấn Minh finished 20th out of 80 players in the World Junior (U-20) Chess Championships which finished in India yesterday. Minh tied with Lorparizangeneh Shahin of Iran in the 13th round and lost to Sunilduth Lyna Narayanan of India in the 12th round. However, in the 11th round, he defeated Srijit Paul of India. After 13 rounds, he finished with 7.5 points. Minh’s younger brother, Trần Minh Thắng was 64th with 5.5 points. He lost to Sammed Jaykumar Shete of India in the last round, drew with Ivic Velimir of Serbia in the 12th round and won Nyamdorj Davaaochir of Canada in the 11th round.